Coconut oil is a delicious ingredient to cook with. The many uses and the health benefits of coconut oil will convince you to add it to your pantry! This week my children were pleasantly surprised (ok, astonished) when I served them small bowls of vanilla ice cream with strawberries and chocolate sauce drizzled on top. The sauce hardened when it hit the ice cream – in a very good way! One day this summer I will dip a vanilla ice cream cone into it, simultaneously creating a hard shell and going down in history as the best mom ever. This sauce is a much healthier alternative to the store bought stuff since you can choose the quality chocolate chips and because it contains the health benefits of coconut oil, a super healthy saturated fat. Over the last couple of years my family has been eating more coconut oil. My 2-yr old daughter even requests a teaspoonful now and then when she sees me cooking with it. I am happy to give it to her. Coconut oil is efficiently metabolized (burned up into energy) and can contribute to weight loss in some people when used in place of refined vegetable oils. It is rich in medium-chain fatty acids, a.k.a. medium chain triglycerides (MCTs), which are easily digested since they do not require bile salts to break them down. Most of the fats we consume are long chain triglycerides (LCTs) and are not processed so quickly. Some oils containing LCTs are a healthy and essential part of the diet, such as fish, flax, and olive. But refined vegetable oils (also LCTs) such as sunflower, safflower, cottonseed and margarine are usually over consumed and very taxing on the body. We avoid them. Another of the health benefits of coconut oil is it is a superb immune booster. It is antimicrobial, antiviral, antifungal, and antiprotozoal. This is because it contains generous amounts of lauric acid, a fatty acid found in very few other foods. Lauric acid is converted to monolaurin in the body where it takes on all of these amazing immune-building properties. One of the only other major sources of this is breast milk! Coconut oil can alleviate digestive issues, and I have seen evidence of this in my own experience with it. There are several reasons for this. 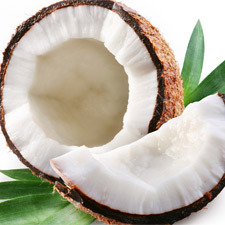 First, coconut oil eases the burden of digestion since it is quickly metabolized. Second, studies show that coconut oil has anti-inflammatory properties so it can be healing if there is inflammation in the intestines. Finally, coconut oil is a known treatment against the overgrowth of Candida albicans, bringing bacterial flora into a healthier balance. Plus, it just tastes good. Really good. Enjoy the tasty health benefits of coconut oil! Combine ingredients and gently heat in a small saucepan or melt in the microwave (30 seconds). Stir, then drizzle over fruit or ice cream. Served warm or at room temperature it remains a sauce, over ice cream it becomes a shell. Natalia Gill is a Pilates and yoga teacher, as well as a Dr. Sears’ Certified Health Coach. Over the years she has worked with hundreds of people from all walks of life including competitive athletes, post-rehab clients, children, and the elderly. She believes that healthy living isn’t only our mission, it is our design. And knowing this allows her to bring out the best in her clients.